Impress family and friends with this simple yet delicious recipe. Make 2 large squares of foil, place 2 mushrooms on each, skin side down. 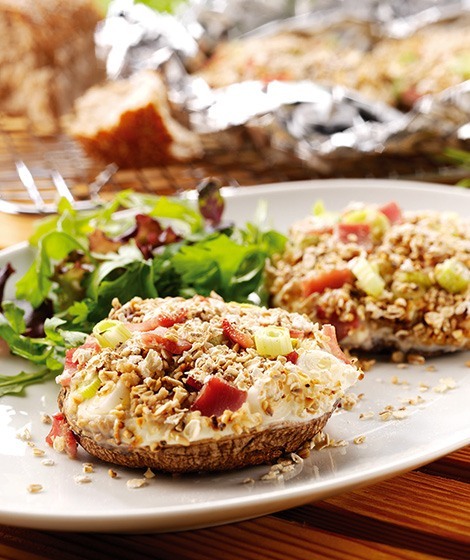 Spoon the cream cheese over the mushrooms, then sprinkle over the spring onions and ham. Mix together and toast the oats and oatmeal by dry frying them in a frying pan for 1-2 minutes or so, until golden and giving off a lovely fragrant, nutty aroma. Sprinkle over the mushrooms. Fold over the foil and seal to create a parcel. Place the 4 parcels on a large baking tray and bake for 20 minutes. Replace the ham with salami or sliced cooked chicken, or sliced beef tomato for a vegetarian option.